Ali Akbar Velayati, the Iranian Supreme Leader's adviser on international affairs, has dismissed reports that the Iranian government has had secret negotiations with American officials. In an interview with the Mashregh website, Velayati said: "As far as I am aware of the government's decisions, there are no direct talks with America." 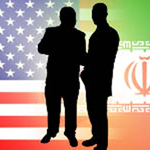 The French daily Le Monde had reported earlier that Iranian and American diplomats have been meeting for talks in recent years, predominantly in Switzerland. The report added that Robert Enron, a U.S. official who had offered an exchange of enriched uranium with Iran, has had several meetings with Ali Akbar Velayati. Meanwhile, the Kaleme opposition website reported that Ali Akbar Velyati and Hossein Taeb, the head of Iran's Revolutionary Guards corps intelligence division, have travelled to the U.S. in order to establish direct negotiations with U.S. officials in secret. Velayati told Mashregh: "Our logic vis-a vis the United States is clear: They say our nuclear activities are not peaceful but we will not cave in to their demands because even if we temporarily forgo our right (to uranium enrichment), they will find another excuse." The U.S. and EU want Iran to stop its uranium enrichment activities, but Iran says it has a right to enrich uranium as a signatory to the NPT. Velayati stressed that if Iran retreats, Western countries demand even more, and those who have "proposed compromise and flexibility against U.S. policies" have not yet "offered an actual solution." 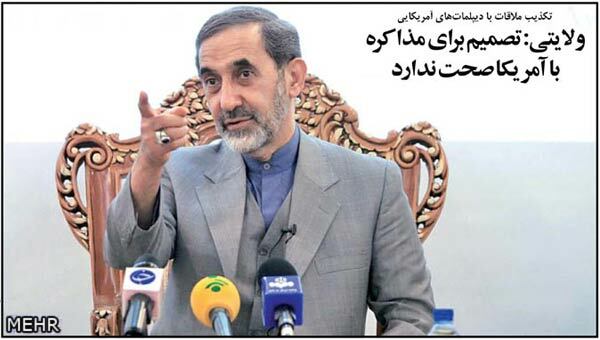 Velayati said: "How far should the Islamic Republic show malleability? What guarantees are there that, for example, if Iran agrees to a part of Western demands, they will stick to their claims and promises? Will they not interpret such as move as the Islamic Republic's weakness?" Iran is facing widespread sanctions imposed by the U.S. and EU, resulting in significant reductions to Iran's oil export revenues and its ability to carry out international transactions in foreign financial institutions.